Whenever a filmmaker of note premieres a new film, it’s a good time to revisit that director’s first film to gauge how far they’ve come as an artist. With Baby Driver hitting theaters on June 28th, we take a look back at Edgar Wright’s A Fistful of Fingers. Edgar Wright has built his career on pastiche—his back catalogue contains the DNA of everything from George Romero’s zombie pictures to The Legend of Zelda to Invasion of the Body Snatchers—so it makes sense that his debut operates within one of the most enduring genres of all time. A spoof Western titled A Fistful of Fingers, the movie is a remake of an undistributed picture (of the same name) Wright made while still in school, and though the reboot has not shaken the student-film look (the characters’ clothes are clearly costumes, and the actors look to be no more than in their early twenties), it is witty and relentless enough to dodge most accusations of amateurism. In fact, as the film progresses, its cheapness of production quickly becomes an asset, enhancing the impression of performative, self-conscious genre burlesque of the sort that wouldn’t feel out of place in the oeuvre of Mel Brooks. A Fistful of Fingers resembles its eponym—Sergio Leone’s Spaghetti Western A Fistful of Dollars—not so much in overall plot as in an abundance of isolated elements, the most obvious of which is The Man With No Name, here played by Graham Low with the same leery squint, taut-mouthed scowl and patterned shawl that made Clint Eastwood into a genre icon. At the start of the film, Low’s “No-Name” is chasing after an outlaw named “The Squint” (Oli van der Vijverin) in the hopes of collecting the bounty on the criminal’s head. His journey brings him to a village, and his cold reception by the townspeople is pulled straight from the analogous scene in the Leone film. Well, not quite. In the 1964 classic (and Akira Kurosawa’s Yojimbo, on which that film was based), the wanderer arrives to find the streets empty and the villagers peering at him, frightened, from within their homes. In Wright’s picture, the apprehension of the townspeople is expressed through their dissipating from the streets with a gusto evoking the scuttling retreat of roaches in the presence of light. In a brief comedic montage, various doors are slammed shut in quick succession, the last of which isn’t actually attached to a house (after fleeing out of sight, the townspeople behind the houseless door stick their heads out from behind the doorframe to continue surveilling No-Name). The above-mentioned moment exemplifies the kind of humor that pervades A Fistful of Fingers. For every send-up to the narrative, iconographic and cinematographic conventions of the Western genre, the film throws in a handful of other gags, many of which land while the initial punchline is still unfolding. In No-Name’s entry into the village, a pointed parody of a famous scene ends with a comic oddity—the standalone door—that has no direct referent in the Leone picture. Rather, this bizarre door is a pure, comic non-sequitur that flies in like something from a silent comedy then leaves to never be addressed again, capturing the kind of breathless cascade of comedic moments that makes A Fistful of Fingers such a blast. Lesser comedies labor to land each punchline, but with Wright’s, each joke seems to spin out sideways to trigger two, three more, giving the impression not of a movie that’s trying to be funny but a genuinely funny movie, one where humor comes as naturally as breathing. No, not every gag works, and on occasion, the jokes are too juvenile to be genuinely amusing, but the film’s comedic output is so constant that any duds are overwhelmed by five or six that leave us no time to be disappointed. The easygoing but tireless comic momentum of A Fistful of Fingers is the kind that would come to define Wright’s later work. In addition to the sheer quantity and velocity of his gags, one thing that distinguishes Wright from the modern pack of cinematic humorists is the extent to which his comedy exploits the tools of the medium. Wright uses slapstick, silly facial expressions and wordplay as liberally as any comedic director (though, it must be said that A Fistful of Fingers drops puns to a degree that most comedies, to their detriment, are not shameless enough to attempt), but his punchy editing and whirligig camerawork set him apart. One great comic moment begins in a medium close-up of No Name’s face as he spits derisively in response to another character’s remark. Convention dictates that this shot of spitting will be the first and last depiction of the gesture, but then the film cuts to a shot of another character dodging right and then immediately afterwards to a shot of a picture frame falling off the wall. Importantly, these latter two shots are extremely brief, such that we have a real-time sense of the spittle flying out of the mouth, past the guy’s head and into the picture frame despite not seeing any actual airborne saliva in the second and third shots. Presenting this entire episode in a single take might very well have been funny in its own way, but Wright’s treatment gives the moment a crucial rhythm. With scenes like these, Wright demonstrates that, just like timing is essential for stand-ups, so the cinematic comedian can—and, in many cases, should—do the same with shots and scenes. 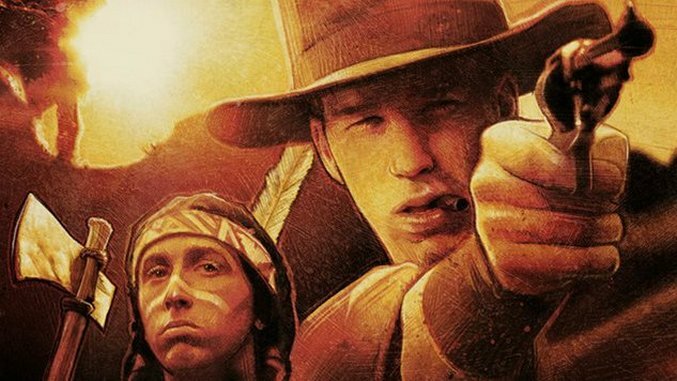 Even if one were to remove the more overtly medium-specific comedy of A Fistful of Fingers, however, one would still be left with much to savor. For instance, Wright repeatedly calls attention to the artifice of his filmmaking to amusing effect, such as when a sideways pan away from a sign that says “Edge of Cliff” reveals another that reads “Edge of Frame,” or when one character, presumably punching another in the face (as seen via a shot that is ostensibly from the victim’s perspective), is revealed to be quite literally shadowboxing in front of the cameraman’s lens, hence the POV shot. Both examples—the latter one especially—recall the meta-filmic hijinks of Mel Brooks’ High Anxiety, which includes a scene where a voyeuristic tracking shot moving up to a window ends with the camera lens punching through the glass. The main issue with Wright’s otherwise ace approach to critique is that he only points out what’s wrong without making any attempt to change it—the Native American is still played by a white guy, and the women, in the few seconds they’re onscreen, are still virtually mute. Then again, there’s only so much you can do as a 20-year-old recent graduate on a shoestring budget, which severely restricts whom you can cast, not to mention where or what you can shoot. Back in 1995, the fact that A Fistful of Fingers still emerged as good as it did despite such limitations spoke to Wright’s promise as a fledgling director, and since then, he has exceeded his early-career potential in leaps and bounds. Needless to say, Baby Driver couldn’t come soon enough.